The combination of flute and harp is one that is peculiarly satisfying, the one instrument a foil to the other. The eleven transcriptions recorded start with the Intermezzo from Bizet's Spanish opera Carmen, a realistic drama of love, jealousy and murder, set in Seville. The combination of flute and harp is one that is peculiarly satisfying, the one instrument a foil to the other. The eleven transcriptions recorded start with the Intermezzo from Bizet's Spanish opera Carmen, a realistic drama of love, jealousy and murder, set in Seville. The Intermezzo that serves as an entr'acte before Act III sets the scene as the gypsy smugglers climb to their stronghold in the mountains, ready for a new enterprise, joined by Carmen and the soldier, Don Jose, whom she has seduced. The Minuet (4) is a transcription drawn from Bizet's score for the melodrama L'Arlésienne, a collaboration with the writer Alphonse Daudet, but now better known as part of a suite drawn from the original work. The Meditation from Massenet's opera Thais enjoys the greatest popularity. The opera, first staged in Paris in 1894, is based on a novel by Anatole France and centres on the courtesan turned saint of the title. The Meditation, an Intermezzo in the second act of the opera, depicts in musical terms the conversion of the worldly Thaïs and later is recalled as she parts for ever from Athanaël, the monk instrumental in her conversion, but tormented by her beauty. Auguste Durand, whose name is well known as the founder of a distinguished French firm of music publishers, was a fellow-student of Cesar Franck and Saint- Saëns, and later the publisher of their works. The Waltz in E flat major, Opus 83, is an original composition for harp. His Chaconne (7) is also an original work for the same instrument. The music of Debussy often lends itself particularly well to flute and harp transcription, since both instruments have an important part to play in his orchestral scores, and have a special and evocative place in his chamber music in a remarkable sonata for flute, viola and harp. En bateau is the first movement of Debussy's Petite Suite for piano duet, completed and published in 1889. The name of Maurice Ravel is often coupled with that of Debussy, an implied comparison that was pleasing to neither. With a mother from the Basque region and a Paris home background that had in it a Spanish element, he was well able to capture the spirit of Spain in music crafted with the meticulous precision that he inherited from his Swiss father. The Vocalise-étude en forme de habanera was written in 1907. In the period that immediately preceded that of Mozart, Gluck occupied a position of pre-eminence in opera, both in Vienna and in Paris, associated, as he was, with a reform in the genre, allowing a more realistic balance between music and drama. The reform began in 1762 with his opera Orfeo ed Euridice, in 1774 adapted for Paris in a French version. The plot concerns the attempt by the legendary musician of the ancient world, Orpheus, to bring back from the Underworld his beloved Euridice. The Dance of the Blessed Spirits is well known as a work for solo flute. It is, in fact, a part only of a more extended ballet that comes in the second act of the French version of the opera. Mozart is said to have disliked the flute, but wrote splendidly for the instrument, even while he complained at the necessity of doing so. 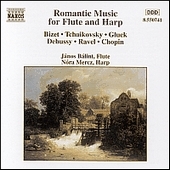 In Paris in 1778 he wrote one of the most beautiful of concertos that combines flute and harp. Towards the end of the preceding year he had embarked on other commissions that involved the flute, at the request of a Dutch amateur, De Jean, through the agency of friends at Mannheim, where Mozart had spent much of the winter. The Andante, K. 315, is an alternative slow movement for the Flute Concerto in G major written for De Jean. Fryderyk Chopin wrote almost exclusively for the piano, the instrument that he himself played, and taught after settling in Paris in 1831. His Variations on a theme from Rossini's Cinderella opera La Cenerentola were written in Warsaw in 1824, at the age of fourteen, and scored for flute and piano. The work was published only posthumously. The name of Edmund Schuecker is best known to harpists. Born in Vienna in 1860, he enjoyed a successful career in Europe before, in 1891, joining the Chicago Symphony Orchestra. He returned to Vienna in 1900 at Mahler's invitation, when he joined the Court Opera. His Opus 12 Mazurka is the most often heard of his pieces for solo harp. Transcribers have found a happy source for duo arrangements in the Hindu song from Rimsky-Korsakov's opera Sadko. The hero of the title, a merchant and musician, with some of the powers of a Russian Orpheus, before setting out on his adventures in foreign trade, asks a Viking, an Indian and a Venetian to describe their countries. The Hindu song is taken from this scene and gives an account of the wealth of India. The nineteenth century, a period in which the pianoforte largely displaced the harp as an instrument for the demonstration of female accomplishment, brought a ready market for short and attractive piano pieces. Tchaikovsky, like many of his contemporaries, provided suitable piano music, often earning more from its sale than from his more ambitious orchestral works. The Valse sentimentale is the sixth of a set of piano pieces written in 1882 during summer weeks spent at his sister's estate at Kamenka. As he told his brother Modest in a letter, the pieces were written entirely for the money, which he badly needed. The younger Johann Strauss, who inherited his father's gifts and dominated the world of light music in Vienna for half a century after the older Strauss's death, produced a phenomenal amount of dance music, waltzes, quadrilles, marches and polkas. His Tritsch-Tratsch Polka, first performed during a Russian summer season at Pavlovsk, outside St. Petersburg, derives its title from a Viennese satirical publication, that took its own name from a play by the Viennese singer, actor and playwright Nestroy. The title suggests tittle-tattle. The Hungarian flautist Janos Balint was born in 1961 and completed his studies at the Liszt Academy in Budapest in 1984, when he won first prize at the Ancona Competition, followed by a Cziffra award in 1986. From 1981 to 1991 he was principal flautist of the Hungarian Radio and Television Orchestra (Budapest Symphony Orchestra). He is well known as a soloist and chamber musician, appearing with musicians of the greatest distinction and is a member of the teaching staff of Szeged Conservatory and a visiting professor at the Respighi Academy in Rome. A member of the teaching staff of the Liszt Academy in Budapest since 1976, the Hungarian harpist Nóra Mercz followed her own studies at the Academy with a further period of study in Russia. She enjoys a distinguished career as a soloist both in Hungary and abroad and in 1992 established the Hungarian Harp Centre, where she devotes much energy to the collection, performance and publication of works for harp written by Hungarian composers.